Which makes it even more unusual to come across a completely original, low-mileage example like this one, now owned by Rachel Inglis. But in case you should think that she bought it just because it was a ‘nice-looking little car’ think again, because Rachel is a VW enthusiast through and through. Her first car was a Mk 2 Polo saloon, which her parents bought for her 17th birthday. In truth, it was a bit of an old banger (Rachel reckons that their reasoning was that it wouldn’t matter too much if she crashed it! ), but after passing her test in the car, she grew to love it and is currently carrying out a full-scale restoration. Of course, as with any car of this age, it is becoming rather a long-winded process, including fabricating many parts as all the panels are now obsolete. Other previous cars include an L-registration Mk 3 Polo Fox, which had done 27,000 miles from new. ‘It was in lovely condition and a good runner, but I couldn’t keep it long as I needed the space’. Another was a red Mk 3 Polo saloon which she bought for next to nothing and planned to tidy up and then sell, but unfortunately it was badly damaged by vandals and had to be scrapped. Her current daily driver is a Mk 3 Polo saloon, not modified apart from a set of alloy wheels, but future plans are to re-spray it just to smarten it up and lower it on a set of – 40/60 mm Weitec springs, so that it handles a bit better. Yet another car that she has bought, planning to drive daily while the Mk 3 saloon is having its paint and engine work done, is a basic spec Mk 3 coupé, with the 1.0-litre engine and a 4-speed box, which she says ‘goes quite well, considering’. 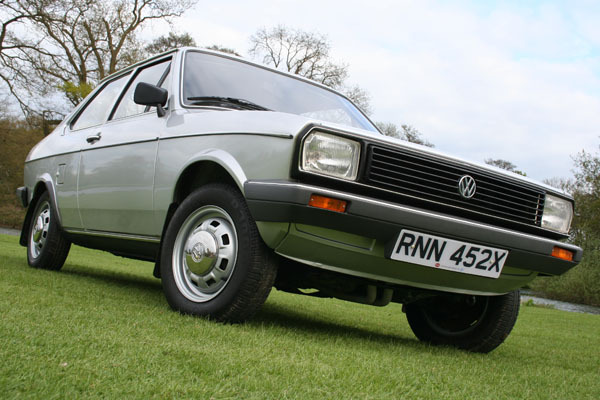 But the real jewel in the crown of her Polo collection is this 1981 Derby GLS, which she bought in March 2009, completely standard, unrestored and with just 17,000 miles on the clock. It was originally supplied by Dockholme Garage Ltd in Long Eaton, one of those old VW garages which no longer exists, as a housing estate has since been built on the site. The Derby’s key still has the original dealer tag on it, clearly showing the garage name and telephone number. The original owner, now passed away, was a Mr Michalak who bought it after part-exchanging a Fiat 131 Mirafiori. The sales invoice shows that it cost just £4435.00 and was fitted with accessories – a manual radio and four mudflaps! Mr Michalak obviously didn’t use it very much over the years, and when he died it was passed on to his wife and then to their grandson, who sold it to Rachel when he emigrated. With such a modest mileage, there isn’t a huge amount of service history with the car, as it has had just basic work carried out to get it through the MoT every year, things like brake hoses, top mounts, and the cambelt has also been replaced. It has clearly been serviced regularly, though, obvious just by looking under the rocker cover and the fact that it still runs so smoothly. Apart from a good clean-up, the Derby has needed very little work and not long after she bought it Rachel entered it in the concours at the Ultimate Dubs event in Telford, where it was much admired amongst all the gleaming big-budget show cars. It has also won an award for ‘Best Watercooled’ in the Run to the Hills event, came in the top 15 at Dubmania, and among the top 20 at the GTI Spring Festival, but its most significant achievement is a second place in class in the prestigious concours at the 2010 Stanford Hall event. So superbly preserved is it that the car needs no restoration as such, but there are some minor scuffs on the paintwork which need to be attended to and Rachel has plans to remove the engine to fully detail it to original standard condition in time for the 2012 Volkswagen show season. The paintwork is, according to Rachel, ‘a little shabby after 30 years’. In the meantime, now with just over 21,000 on the clock, Rachel really enjoys driving it – not every day, of course – but as a special treat, and when visiting the various VW shows throughout the season, and the car appeared in the concours at 2009’s GTI International. Rachel would like to say a big thanks to Steve Morris for being a huge help, her friend Charlie Baldwin who came to view the car and taught her about Derbys, to another friend, Karl Halewood, who helped her out at last year’s shows, and lastly her parents, for putting up with all the old VW parts around the house for the last six years! Thanks to Neil Birkitt, editor, Volkswagen Driver magazine. This article originally appeared in the June 2010 issue and is reproduced by kind permission. Hi. Is there a chance to contact Rachel? I just bought the same car but without carburettor and I need to find what kind it is. Please help me.